All of our fruit is California Grown. Our season begins April with fruit coming out of the Kettleman City area. While water can be scarce in the area, the warmer temperatures allow the fruit to develop a full month earlier than fruit grown on the East side of the valley. Not only does this allow us to provide you with flavorful fruit earlier in the season, but it also cuts back on the fuel emissions it takes to import fruit from other countries. 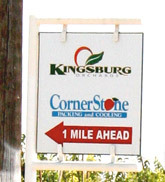 The majority of our crops are grown in and around our hometown of Kingsburg. The weather warms enough in May to ripen the fruit and production reaches its peak between July and August when temperatures reach into the 100-115°F range. We continue to pick fruit into October.